You are here: Member pages » adampl » pictures » A fascist slogan? 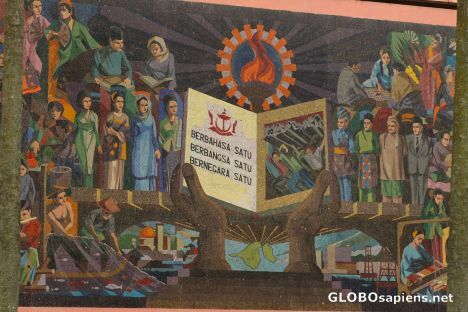 My Malay language is very poor, but I could understand what I found on this mosaic on the front wall of Bruinei television building. It says: 'One Language, One Nation, One Country'. Does it remind you of somehting? I was a bit shocked. I knew the politics of the government is nationalistic, but I didn't realise that it's to such an extent.